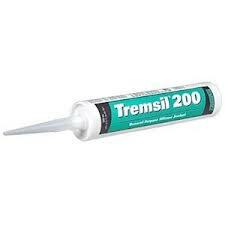 Tremco Tremsil 200 is a one-part, acetoxy, general construction grade silicone sealant. Tremsil 200 will cure to a flexible rubber when it becomes exposed to moisture that is present in the atmosphere. Tremsil 200 silicone sealant generates a weather-tight seal to glass, metal, porcelain, ceramic and most painted surfaces. Although other colors are available, white and clear include fungicide inhibitors which make this silicone sealant suitable for use in bathrooms, spas and similar environments where joints need protection against fungi and bacteria. Tremsil 200 silicone sealant conforms to ASTM C 920 Type S, Grade NS, use NT, G, A, and O and CAN/CGSB-19.13-M87 and U.S. Federal Specification TT-S- 00230, Class A, and U.S. Federal Specification TT-S-001543A Class A.